I was first introduced to the Aunkai by my friend and colleague, Robert John. From the beginning, I knew we were taking an approach to bujutsu like none I’d ever been exposed to before. The teacher, Minoru Akuzawa, had through his own training and research reduced his bujutsu to nothing but the simplest core elements. Here there would be no wasted movement, no wasted energy, and no wasted time. Others here and elsewhere have written on the basic principles we use (body axes, centering, rooting, etc.) in much greater detail and in greater depth than I can, so I will leave the reader to explore them on their own. I will also assume the reader knows the rules of sanda and how a sanda match typically proceeds. The sanda session we held here in Tokyo on September 18th, 2006, was to be my second attempt at applying those principles against a real live human opponent who would be trying to impose their own will upon me at the same time. My goals this time were the same as they were last time: remain calm, keep my structure intact, claim victory over my own fears and anxieties. In the last session I accomplished some of those goals, and this time I was hoping to build on the experience and on my training in the interim. I am happy to say that I have made some progress, which I will report for you now. My match was the first of the evening, and I was paired with a newcomer. A grappler, he is well built for the ground game. For stand-up, however, he seemed far too tense. In a way, this perhaps encouraged me to let go of my own tension, calm down, and deal with his attacks successfully. Of course, I took my own share of hits (including one that gave Mitsuhashi my back and very quickly ended the engagement), but for the most part I gave a good account of myself. By the end of my match, I knew that I still had to work on pursuing my three goals, but I also knew that if I am able to do this much with little or no time dedicated to sparring practice, then the Aunkai way (Frame <> Principle <> Foundation) must be the real deal. Watching the rest of the matches that day only reinforced my conclusions. In particular, the need to stay loose and fluid, the need to stay in gthe pocket?Ewith your assailant, and the ultimate futility of a purely technical approach were clear to me. The next step for me is to constantly be training as though the next sanda session were tomorrow, since the pursuit and ultimately the accomplishment of my three goals can only lead me to one place: total control of the self, and therefore by extension control of my opponent to the point where the idea of gopposition?Eitself becomes unnecessary. Aunkai has a strong focus on training in posture and use of center of gravity, to become stable in a manner transcending age. What does it mean to talk about body usage that transcends age? Why is it that this cannot be achieved without relaxation? What is internal usage in comparison to external usage? What kind of tanren is it that develops deep understanding of posture? 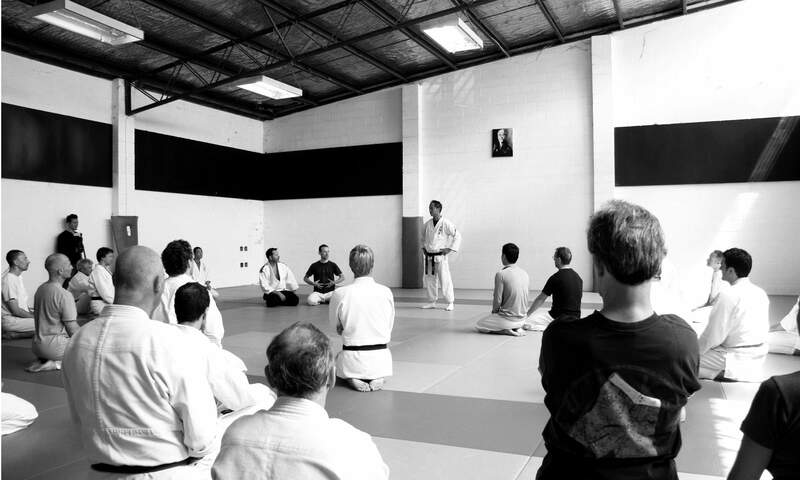 In this seminar, regardless of level, participants will experience the progression of training from contact, through unbalancing, to striking and free practice in a fun manner conducive to learning. Note: direct participation without prior application is not permitted. Participation: 18 years or older and in good health. Experience not required. No other particular prerequisites.